A crew has been working for the last few weeks to remove the pillars and remaining portions of the boardwalk that were damaged in 2010. There are no plans at this time to rebuild that section of the boardwalk. Heading north on highway 11 from Shediac take exit 32A to Bouctouche. Turn right on Irving Boulevard (Route 515). Continue straight through the town of Bouctouche and along the coast. At 10.1 km from the exit you should see a small sign on your left showing the entrance to the parking lot. There is a small colorful takeout just beyond the parking lot entrance to indicate that you have gone too far. The Eco-Centre is on the right. The small parking lot in front of the cetre is reserved for buses. Heading south on highway 11 from Miramichi take exit 42 to Saint-Anne. Turn left on Gratten Road towards Route 134. After 700 meters turn right on route 134 towards Saint-Anne-de-Kent. After a short distance (350 m) turn left onto Route 475 towards Cap-Lumiere. Continue straight on Route 475 for 3.8 km to Chockpish. Turn right on Route 475 at chockpish and continue to follow it along the coast. At 5.4 km you should see a small colorful takeout on your right. Just past the takeout is the entrance to the parking lot for the Bouctouche Dunes. There is a small parking area in front of the Eco-Centre on your left that is reserved for buses. From the parking lot cross the road to the Eco-Centre and the boardwalk and beach beyond. Bouctouche Dunes is a 12 km sand dune that extends out into the ocean and surrounds Bouctouche Bay. There is an Eco-Centre and a lookout tower at the beginning of the dunes. 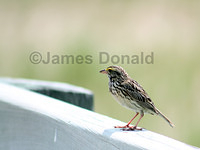 Previous to December 2010 there was also a 2 km boardwalk that started at the Eco-Centre and followed the Dunes. In December 2010 a storm surge destroyed about half of the boardwalk. On our last visit (April 2011) only 850 meters of the boardwalk remained and from what I can find out there are no plans to rebuild the section of boardwalk. This wasn't the first time the boardwalk has been damaged by storm surges. 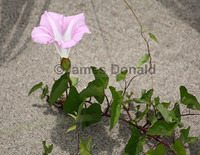 Irregardless of whether the boardwalk will be rebuilt there is still 12 km of sand dunes to explore. It also makes a great beach to enjoy when you are done walking. 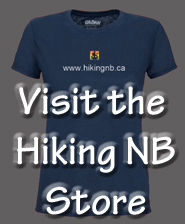 The Irving Eco-Centre's mission is to protect the Bouctoche dune, one of New Brunswick's longest sand dunes, and the rate plants and wildlife at live here. For this unique site's protection and to ensure the safety of visitors, during July and August, access to the dune site between 8:00 and 5:00 pm is limited to the first 2000 people. 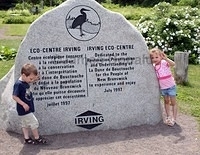 A 5:00 pm the gates will reopen for evening visitors to the Irving Eco-Centre. Because of nesting birds and fragile plants, dogs are not allowed on the site. A dog kennel service is available on request. Ask staff for information on today's interpretive events. Thank you for helping protect this fragile coastal habitat. Page Last Updated November 24, 2012.